[LP cover of Impulse A-9155. [CD cover of Impulse MCAD-39123. 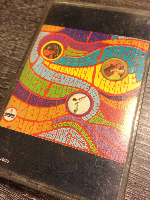 Released as Albert Ayler In Greenwich Village on Impulse (US) A(S)9155, 2546352 (CD), MACD-39123, (Italy) IMP431, (Japan) IMP88064, YP8548, Jasmine (UK) JASM70. 2012 vinyl reissue by De Agostini Publishing (Italy) in the ‘Jazz 33 giri’ series. 2016 vinyl reissue by Impulse (Back to Black series) 06007.5363040. Cassette version on Impulse 39123. [LP cover of Impulse IA-9336/2. Released as The Dedication Series/Vol. 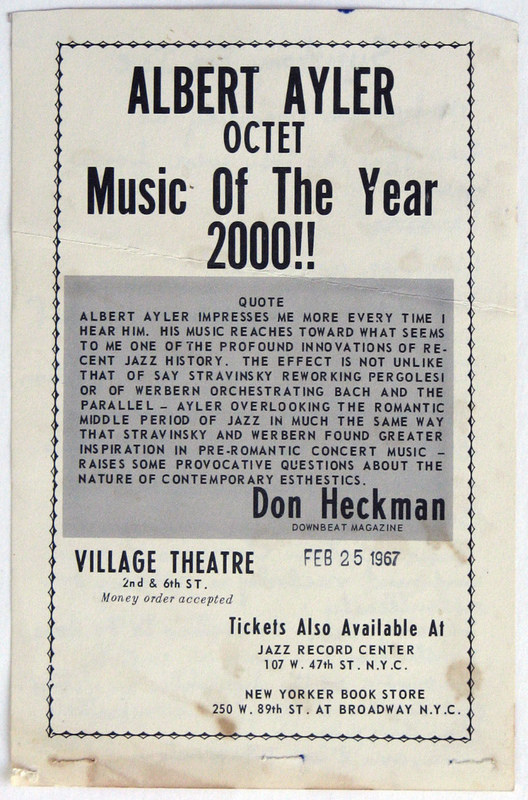 VII: The Village Concerts on Impulse (US) IA9336/2, MCA2-4129. Also released on 8 track cartridge. [CD cover of Impulse IMP22732. 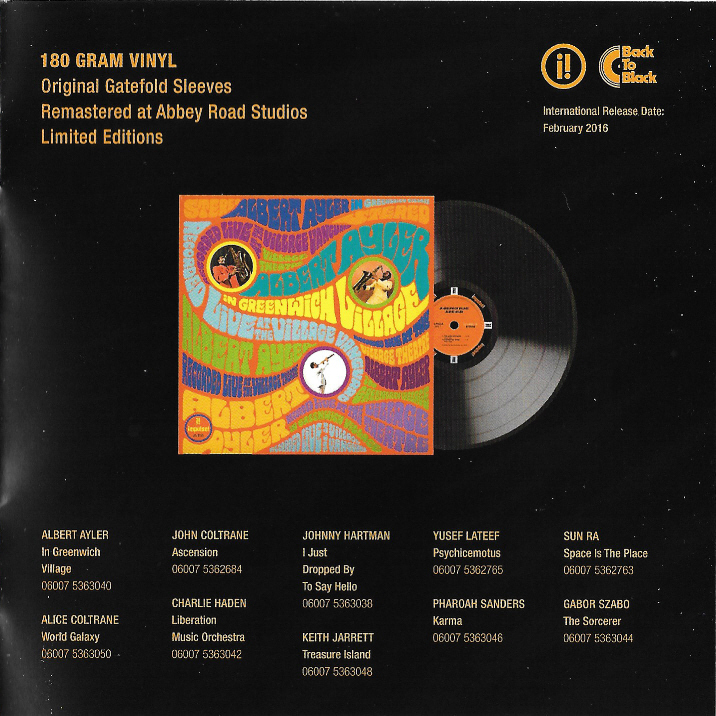 Personnel details for the 12 original tracks are the same. Released as Live In Greenwich Village: The Complete Impulse Recordings on Impulse (US) IMPD 2-273. 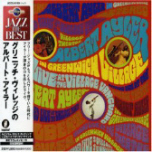 Track 1, ‘Holy Ghost’ is the earliest of Ayler’s ‘Greenwich Village’ recordings and was originally issued on Impulse (US) A(S)-90, HMV (UK) CLP1932, Pathe (France) 2C.154-92336, as The New Wave in Jazz This was a recording of a concert organised by Amiri Baraka (Leroi Jones) at the Village Gate under the title, ‘New Black Music’. 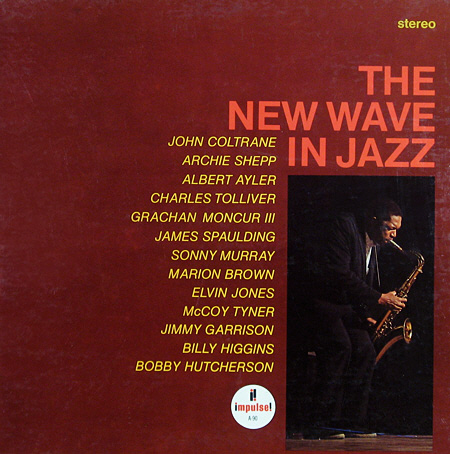 The original LP release of The New Wave in Jazz contained the following selections from the concert: ‘Nature Boy’ by John Coltrane, ‘Holy Ghost’ by Albert Ayler, ‘Blue Free’ by Grachan Moncur, ‘Hambone’ by Archie Shepp and ‘Brilliant Corners’ by Charles Tolliver. For the 1994 CD version (GRP 11372, Impulse GRP11372) the Ayler track was omitted and two new tracks were added: ‘Plight’ by Charles Tolliver and ‘The Intellect’ by Grachan Moncur. 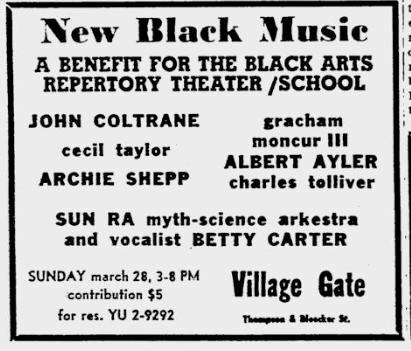 Ayler’s ‘Holy Ghost’ was also released on the compilations, Impulse AS-9257-2 as Re-evaluation: The Impulse Years, AS-1024 as La Saga Heroique d'Albert Ayler, ASD9228 as Energy Essentials, before being reissued on Live In Greenwich Village: The Complete Impulse Recordings.